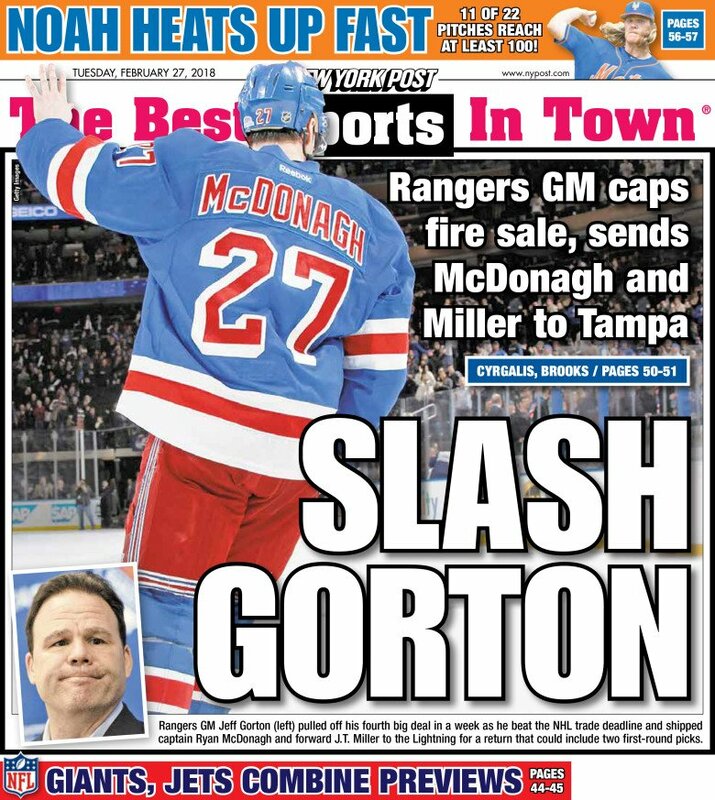 The Rangers are in full rebuild mode, at least that's true if you read the papers (Rangers Embark On All-Out Rebuild, Rangers Went All-In, and of course the overused Fire-Sale, then there's of coruse the back page of the New York Post). Even the more sedate NY Times gets in on the action with the Complete Overhaul. Finally the ever engaging Rick Carpiniello suggest the Rangers have Torn It Down. Hyperbole sells papers and gets you to click on a link, so in that sense they're just doing what they need to do to get paid. So let me state it more clearly. This is not THE Rebuild...at least not yet. Okay, fine...we've gotten that out of the way. "There's a lot of work here. That's pretty obvious. We're trying to build a team. We're adding these assets and doing all these things, but there's a lot of work to be done." There's numerous quotes from Gorton if you care to look past the headlines and proclamations by the beat writers and various and sundry pundits. It's easy to get caught up in the emotion too, given the names that were dealt, but the reality is there's still a large core of players that define the Rangers of today left on the roster. In fact, if you look at the opening night roster, 16 of the 20 players remain within the organization post-deadline. Sure they traded Rick Nash, J.T. Miller, Ryan McDonagh, Michael Grabner and Nick Holden (who wasn't on the opening night roster), but many of the players they entered the season with, are stil here. Furthermore, Nash, Grabner and Holden were all set to be UFAs this summer, and were not necessarily going to be back anyway. Reports have suggested that Gorton began conversations with his Boston counterpart on Nash back in November, even while rumors of a possible resigning emerged in the papers. Holden was a trade candidate even before the season started, and Grabner was always a possibility if the Rangers faltered as they did. More surprising, at least on the surface, was the trading of Ryan McDonagh and J.T. Miller. McDonagh has clearly struggled this year, and has shown a level of frustration on the ice that belies his usual calmness under pressure. The year did not get off well, perhaps capped off by one of the most egregious turnovers to hand the Penguins and early season OT win. He struggled with niggling injuries this year, being forced to sit out 10 days in Novermber with an abdomen injury, a couple of days in January for his back, and finally much of the last 2-3 weeks as the deadline approached. One who was once being talked as a Norris Trophy candidate was having a bad year on a bad defense...on a bad team. On July 1st, 2019 his contract will expire, and he'll beome a UFA for the first time in his career. He'll command a raise on his $4.7M annual cap hit, as well as term that will take the then 30 year old well into the twilight of his career. As for J.T. Miller, that's a more complicated story. Miller has been amongst the top five point getters on the team in each of the past three seasons. The 24 year old was second with 40 points - just three beind Mats Zuccarello this season, second also last year, and fifth as a 22 year old. His position on the team has been one of almost constant transition, moving back and forwards from wing to center as well as across all four lines. Clearly there has been strain between Head Coach Alain Vigneault and Miller since he entered the league, but whether the problem is mostly on the player's side will only be known once we see him spend more time outside of the current environment. Miller's current contract expries this July, and he'll be looking for an increase on his very affordable $2.75M. A $4-5M per year contract would seem likely, should the Lightning want to resign him, a contract that is still relatively affordable in the broader scheme. Of all the players moved, Miller's was probably the biggest gamble. Nash, Grabner and even Holden for that matter could be resigned in the off-season if the Rangers really wanted to, and McDonagh wasn't likely to be able to contribute much in the year remaining, and would likely have been pushing for a less appealing contract come July 2019. Losing Miller hurts for a couple of reasons...one is the very same utility he's shown, not to mention the point production and relatively affordable contract. It'll be some years before we know whether it was worth it. As for what remains, UFAs Ondrej Pavelec, Paul Carey and David Desharnais will all ikely be gone. Whether they elect to retain Cody McLeod will likely depend on what he can bring in the remainder of the year, but odds are he'll be gone too. Minor leaguers Marek Mazanek and John Albert also seem unlikely to be brought back, both likely to be replaced with alternatives that have not yet been tried. That leaves the core players, and questions as to whether a few more of these guys might join the rebuild. Mats Zuccarello was a name bandied about, but ultimately was retained at the deadline. With one year left before he himself becomes a UFA, the Rangers might look to move the 30 year old - 31 at the start of next season - while he still has a year left. At $4.5M, the Rangers leading scorer is still on an affordable contract, and with one year left, a team looking for an offensive winger might make a bid on him that attracts Gorton's interest. Centers Kevin Hayes, Ryan Spooner and Vladislav Namestnikov are all RFAs this summer. The 25 year old Namestnikov is on the final year of his contract which has a Cap Hit of $1.9375M, and will be due probably $4M-$5M or so on multiple years to buy some of those UFA years. The 26 year old Spooner has been paid $2.825M on his current contract, and could be a relatively expensive retention, and may prompt the team to re-evaluate whether to make him an offer, or try to move him. Hayes too has been earning $2.6M, though his ability to kill penalties and play the defensive side of the ice will perhaps tilt the equation a little more towards him. Winger Jimmy Vesey is also up for renewal, and while he's had his moments, he currently carries the 11th worst plus/minus in Rangers history, an eye-watering mark considering that he's played just 140 games, and is averaging just under 14 minutes of ice time per game. On the plus side, the Rangers will need offense next year, and coming off his entry level $925K contract, he should be relatively affordable. On defense, the Rangers will almost certainly extend Brady Skjei, who now stands to be a veteran on a team that will see a significanty different back end. As for the remaining RFAs, it would not surprise to see the team part ways with Brandon Halverson, Daniel Catenacci, Malte Stromwall, Steven Fogarty and Adam Tambellini. Cristoval Nieves could also be a casualty, as could Ryan Sproul. Newly acquired Rob O'Gara and Chris Bigras will be playing for contracts, and how they do the rest of the year will determine what offers, if any come their way. John Gilmour too will be looking for a contract, with his entry level deal expiring on July 1st. Off the roster, the Rangers will have three remaining contracts they probably wouldn't mind dealing in Marc Staal, Brendan Smith and trade acquisition Matt Beleskey....not that there's likely to be any takers without something significant being included or another questionable contract coming back. Marc Staal might even find himself being considered for captain given the paucity of options. Aside fromt the players mentioned, Tony DeAngelo might still have some value and veterans Peter Holland and Cole Schneider might get included in minor-league deals. Prospects Ryan Gropp, Sean Day and to a lesser extent Timothy Gettinger have underwhelmed this year, and might get included...though they have relatively less value at this point, and probably are more likely to be add-ons to a broader deal, or exchanges for similarly positioned prospects on other teams. On the plus side, there are a number of prospects now who could challenge for a spot. Russians Yegor Ryukin and Igor Sheshterkin will not be here next season, as they both still have a season remaining on their KHL contracts, but there's a chance they might make it for 2019-20. Defenseman Ryan Lindgren has 2 years of college eligibilty remaining, but the Rangers may push hard to sign him this summer and move him to the AHL, or perhaps even New York. Libor Hajek and Brett Howden will both also get looks, or head to the AHL for some pro-seasoning. 2017 first rounders Lias Andersson and Filip Chytil will get a longer look too, each now with some AHL play under their belts, will hopefully push harder for inclusion, which may make for an interesting center line-up if both do indeed make the jump. New York could also look to sign prospect Ty Ronning, who has had a career year in Canadian Juniors, but remains without a contract ahead of a June 1st signing deadline. What the team will look like come October next year is anyone's guess at this point, even Gorton doesn't have a clear picture.